A well equipped gaming desktop. It's not often that we advocate playing the waiting game, but if you're planning to build a new system, the smart move is hang tight just a little bit longer to see how Ryzen shakes out, and how Intel responds. Otherwise, another solid option is to scour the sales as vendors look to clear out old inventory for new products. There are deals to be had, including a desktop gaming system from Asus that is on sale at Best Buy for $830. The Asus G11CD desktop carries an MSRP of $1,200, according to Best Buy's listing, so you're saving $370 compared to that price. What you're getting in return is a capable gaming PC with a Core i5-6400 processor, 16GB of DDR4-2133 RAM, and a GeForce GTX 1060 with 6GB of GDDR5 memory. Asus didn't take the cheap route on storage by slapping a hard drive in there and calling a day. Instead, the G11CD pairs a 512GB solid state drive with a 1TB HDD. There's also a DVD/CD burner and a built-in media reader. The front I/O panel has two USB 3.0 ports and two USB 2.0 ports, and separate headphone and microphone ports. Over on the back are two USB 3.1 ports, two USB 3.0 ports, two USB 2.0 ports, GbE LAN, and various display outputs, including DisplayPort, HDMI, and DVI. Onboard Wi-Fi is also featured here. A mouse and keyboard are included. 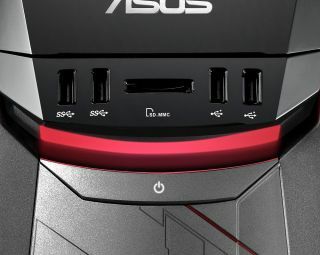 There is no mention of the power supply, though Asus lists on the system's product page 300W and 500W options. We assume the latter based on the GPU option. With a little bit of price hunting you can likely build a system for less. We did a quick and dirty comparison by selecting the same (when possible) or similar components on Newegg and the total came to $770 without a case, mouse, or keyboard. Throw those in and you're looking at roughly $810 to $850. Building your own also has the advantage of being selective with your component choices rather than relying on what a manufacturer pieced together. That said, the sale price on the G11CD brings to the cost down to the price of parts. If for whatever reason you don't want to build your own system, this is a decent deal without the typical premium placed on pre-built systems. You can grab the Asus G11CD desktop on sale here.